The Bollywood film "Chandni Chowk to China" has been banned in Nepal because of a scene suggesting the Buddha was born in India, officials say. 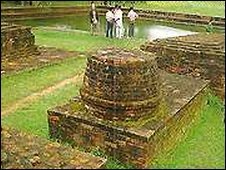 Siddartha Gautama, who became the Buddha around 2,500 years ago, was born in what is now south-western Nepal. 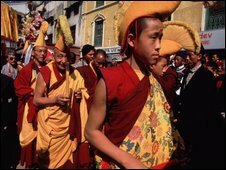 Many Nepalis revere the Buddha and have been upset by the film. Protesters have burned tyres in the capital, Kathmandu. The ban comes even though the offending scene has been cut from the film in Nepal at the request of the censor. "We've banned the screening of the movie in theatres across the country considering the growing public protests over controversial remarks in the film," home ministry spokesman Nabin Ghimire told the AFP news agency. Officials say that the decision to ban the film was taken even though the offending section of the film - a Bollywood co-production with the US studio, Warner Brothers - was cut at the request of Nepali censors. The film is about a lowly Indian chef who is mistaken for the reincarnation of a fabled Chinese warrior. Its official website says that it is "the first ever Bollywood kung-fu comedy". A spokesman for the ministry of information told AFP that while the offending scene had been deleted, it could not be removed from pirated DVDs and videos that are smuggled into the country. The spokesman said that the foreign ministry had also been asked to take immediate steps to stop any unedited screening of the film in other countries. Nepal, created nearly 240 years ago, has been officially secular since the removal of the king last year, but correspondents say many people in the country remain deeply spiritual.